While surveying the military Base where the FLUX TRANSFORMER is being housed, knowing that it can warp time and space, the Turtles ponder as to what Titanus would want with it. Suddenly, they notice assorted military personnel loading it onto a truck and leaving the base. The Turtles need to know where it is going in order to prevent Titanus from getting his hands on it, so April elects to follow it while the Turtles opt to rid the streets of the H.A.V.O.C. mutants. That is until KRAKUS, a cop from the future, arrives and thinking that the Turtles are in league with Titanus, shakes them down for information. Meanwhile, April continues to track the Flux Transformer as it is off-loaded from the military Truck onto a train, and then in the “middle of nowhere”, it is air-lifted onto a helicopter. After April contacts them with the bad news, the TMNT decide to break into the Government Computer Center and access the files pertaining to the Flux Transmitter — maybe they will learn where it has been taken. Unfortunately, they set off the alarms and before they can make good their escape, Krakus reappears and attempts to arrest them. The Turtles get the upper hand and force Krakus to explain to them who he is. It seems that Krakus is from the year 2066 and he is pursuing Titanus, who is also from the future where he almost took over the world with his mutants. But he escaped into the past and is now attempting to recreate his future here in the Turtles’ present. Suddenly, April arrives with her mini-cam and video tapes the battle between Krakus and the Turtles — until Krakus, who is stunned to meet her, reveals that in the future she saves his father’s life and if it wasn’t for her, he would not be alive. After convincing Krakus that the Turtles are the good guys, Krakus apologizes and together they go after Titanus, with Krakus keeping a protective eye on April. Back at H.A.V.O.C. Headquarters, Titanus learns the location of the Flux Transformer and sends a squad of mutants to retrieve it, but panics when he learns that Krakus is here in the present. So Titanus dispatches another squad of mutants to take care of the “TimeCop” – resulting in the destruction of Krakus’ weapons and the “time machine” and also the kidnapping of April. By the time the Turtles and Krakus reunite and storm the H.A.V.O.C. headquarters, Titanus is gone. In his place he left a pre-recorded message outlining his plans for both the FLUX Transformer and for April O’Neil. With no weapons, no time machine and no way back home, Krakus has Donatello use Titanus’ MUTATION GENERATOR to transform him into a giant mutant so that he can save April. She must live to save his father, so that he may be born. 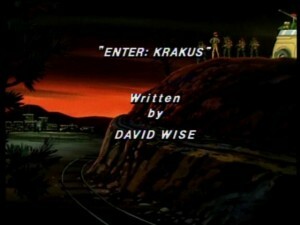 After successfully rescuing April, the mutated Krakus and the Turtles stop Titanus from bringing more mutants through his TimeGate into the present, send Titanus back to the prehistoric past, and send Krakus (now reverted back to normal form thanks to a “Duration Timer” on the Mutation Generator) back to the future.